Patty Mint is a deep mint green micro-glitter with assorted mint, emerald green and neon green glitter accents in a mint-shimmered base. All nails are 3 coats with top coat. Patty Party is a multi-glitter featuring green and black with assorted accents in a warm pink and green-gold with a multi-shimmer clear base. Shown is 1 coat over 3 coats of Orly Color Blast Violet Blue. The Luck of the Paulish is a green and gold holographic microglitter—accented with stars—with two sizes of green metallics, tiny gold holographics and micro-mini silver holographics in a clear base. Nail art glitter featuring green stars, shamrock wanna-be clovers, green moons, fairies, unicorns and witches is included. 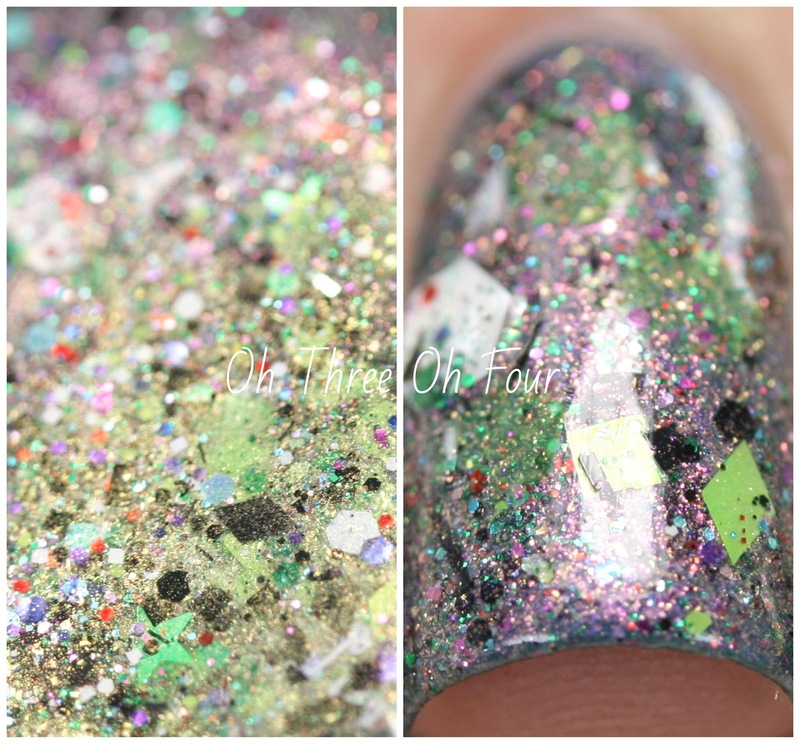 These photos show 2 coats with added glitters. Top o’ the Glitter contains an assortment of green glitters in metallic, matte, holographic and neon in a minty green shimmered clear base with shamrock wanna-be clovers. All nails are 2 coats over 2 coats of OPI Hey Baby. Purchase Lynnderella limited edition and core lacquers through Lynnderella.com. International readers can find core lacquers from Norway Nails and Glitter Connect. Make sure to follow all the Lynnderella fan pages on Facebook, Twitter, Instagram, Pinterest and Tumblr.